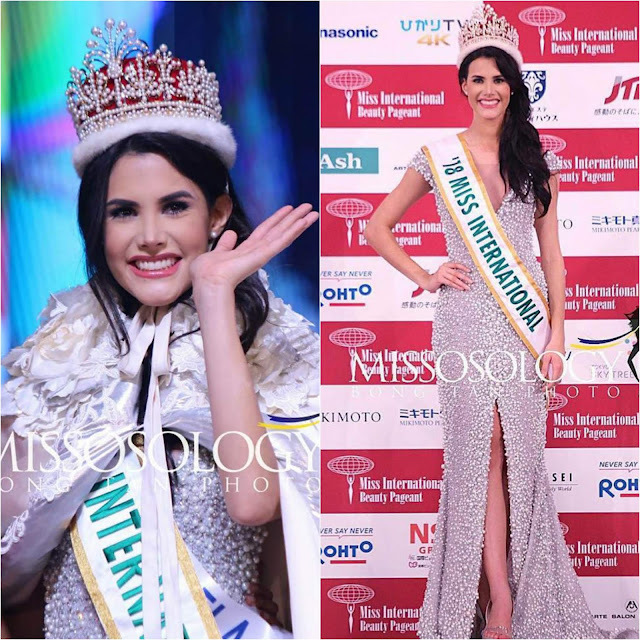 Home » Latest » Mariem Velazco » Miss International 2018 » Miss International 2018 Mariem Velazco » Miss Venezuela International 2018 » Sashes and Tiaras » Sashes and Tiaras Miss International » SASHES AND TIARAS.....Miss International 2018 Finals, Top 10 BEST EVENING GOWNS Recap! SASHES AND TIARAS.....Miss International 2018 Finals, Top 10 BEST EVENING GOWNS Recap! The 58th Annual Miss International was held earlier this month in Tokyo Japan and I discussed my TOP TEN BEST PICKS of the National Costumes HERE so now it's time to RECAP my Top PICKS for Evening Gowns! But first, let's discuss the winner...beating out 76 other contestants from around the world, Venezuela's Mariem Velazco won the top crown. The 1.77 M (5' 10") tall, 20 years old model hails from the state of Anzoategui in Venezuela. 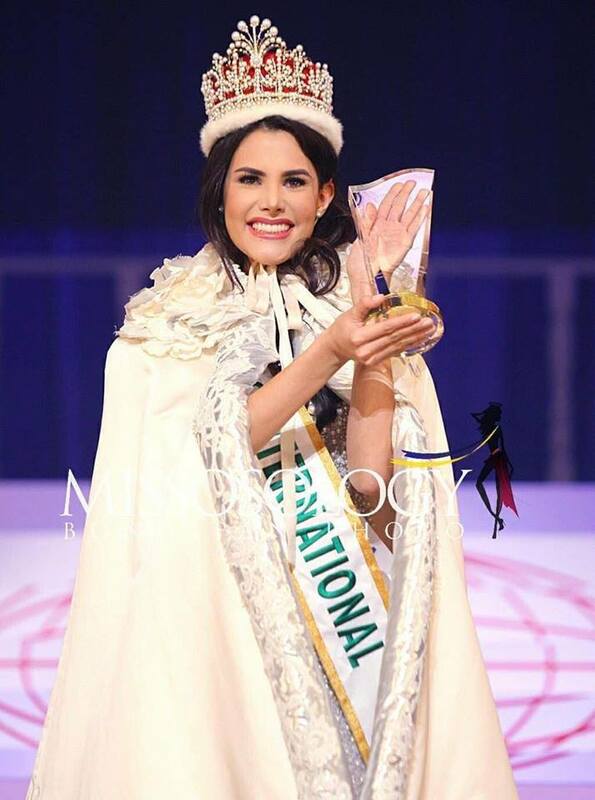 Mariem represented the state of Barinas last year at the Miss Venezuela 2017 pageant where she got the title of Miss Venezuela International. 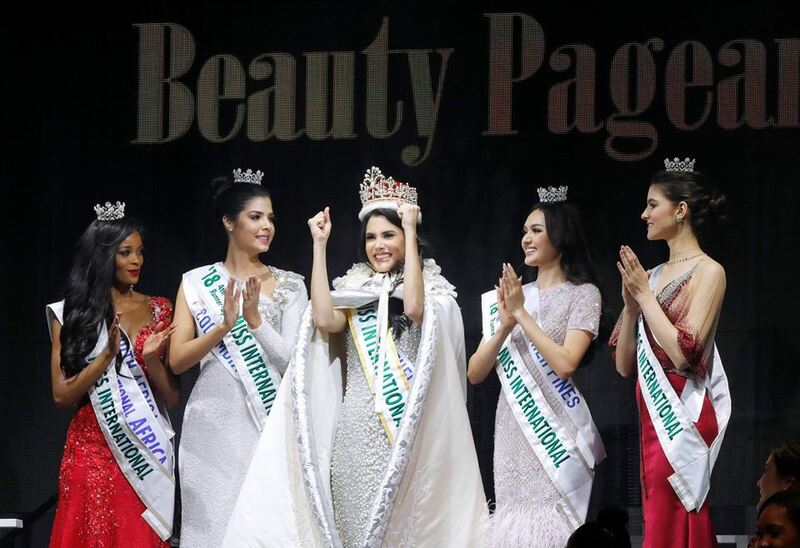 Her victory in becoming Miss International 2018 gave her country the EIGHTH crown for that country, becoming the most ever for a single nation in the history of the pageant. ...a center front slit to show leg, and "open back" covered in see-through illusion. It was PERFECTION, even down to the matching shoes. This could easily also be the most gorgeous wedding gown. Add a veil and a bouquet and Done & Done! Fabulous. 2. Miss Colombia International Anabella Castro Sierra--My second favorite gown of the Miss International 2018 Finals was this one worn by Miss Colombia International. The ivory sequined dress was created by legendary Colombian designer Alfredo Barraza. This design was simply beautiful in the way it fit her, how she wore it, the asymmetrical neckline details as well as the silver appliques that adorned the upper torso. It was chic, elegant and pure gown perfection. 3. 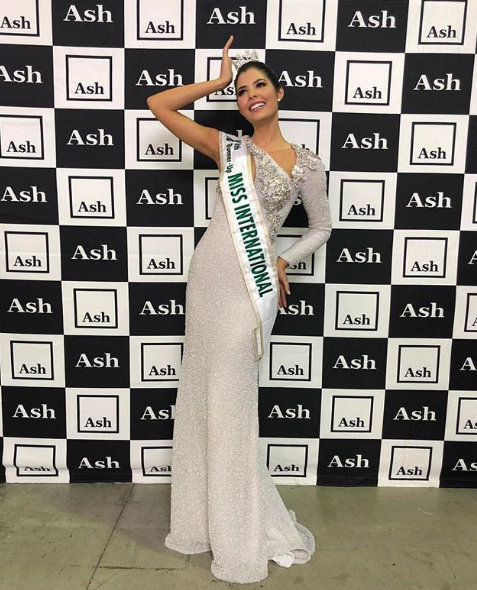 Miss Mexico International Nebai Torres--Nebai won the title of "Best Dresser" and with her evening gown choice, she proved why. Miss Mexico International also wore an ivory colored sequined gown, this one featuring heavily beaded lace, a fit-and-flare shape and dramatic back cape. 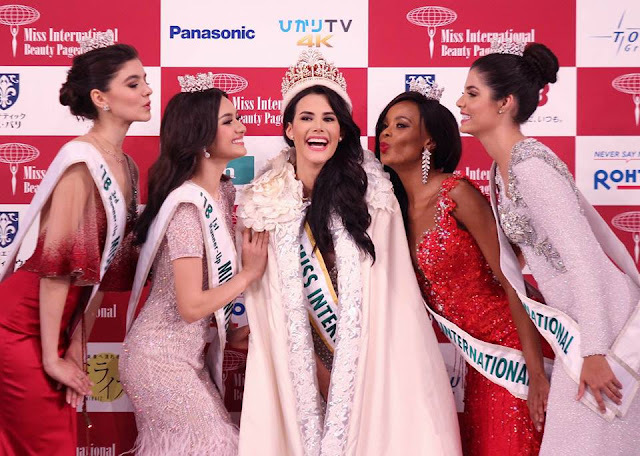 She was giving you lots of Gown Drama, but in a sweet Miss International way (the Japanese-based beauty pageant loves its winners and contestants to be--let's just say--"sweeter". Not your typical va-va-voom pageant style. This design achieved all of that...and more! 4. Miss Thailand International Keeratiga Jaruratjamon--Miss Thailand International wore my 4th favorite gown in this ivory sequined column design. The dress fit her beautifully and was stage impacting with its elegant pleated chiffon cape. 5. 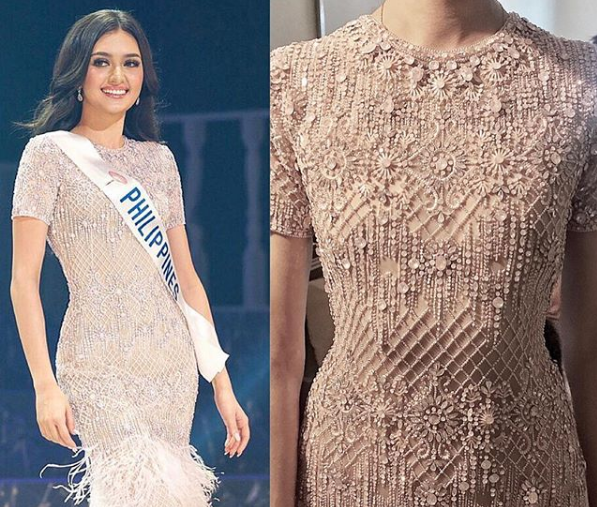 Miss Philippines International Maria Ahtisa Manalo--Maria Ahtisa Manalo, Miss Philippines International made my Top Five wearing a couture Michael Cinco fully beaded blush pink gown with exquisite crystal details in delicate tulle with feathers from the designer's "Impalpable Dream of The ROYALS" Spring-Summer 2019 Collection. The gown was beautifully made--it's Michael Cinco after all!--and showcased the designer's trademark sequin workmanship from his Dubai-based atelier. 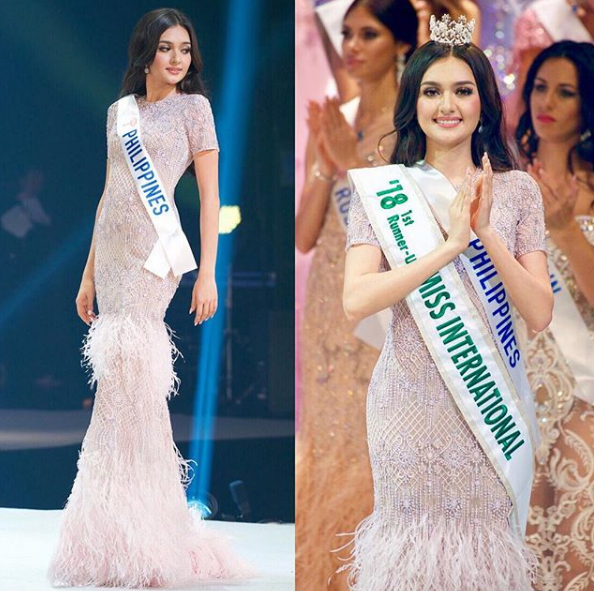 Simply gorgeous, and staying true to the "Miss International Sweet" vibe. 6. 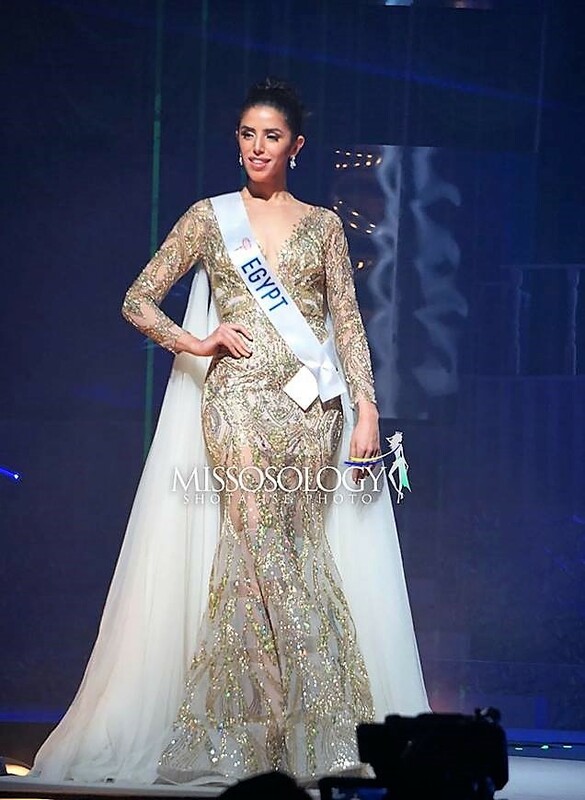 Miss Egypt International Farah Sedky--OH MY GOD...it's NOT IVORY! OK, kind of, but mostly gold...and ivory! This golden sequined-and-sheer gown worn by Egypt's Farah Sedky, made my No. 6 spot. The dress had a fit-and-flare "Mermaid Lite" shape, fit her beautifully and featured long sleeves, a v-neckline and very full back cape. It was dramatic, stage-impacting and looked expensive! 7. 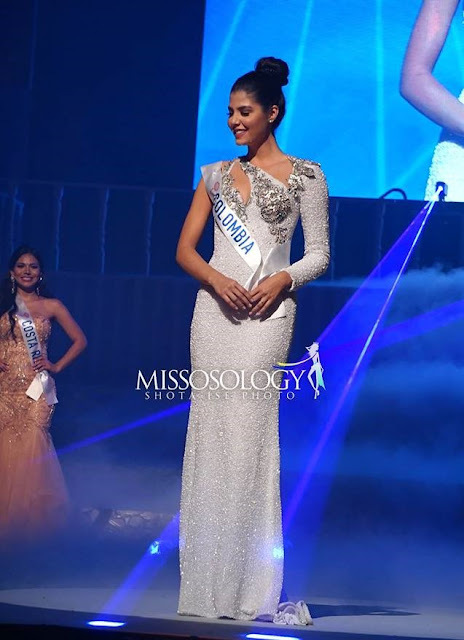 Miss Guatemala International Gabriela Castillo--I really liked Miss Guatemala International's choice of gown for the Miss International 2018 Finals. This was another ivory sequined gown and looked gorgeous on her. I loved the no-slit silhouette and chiffon capelet-like sleeve detail. I especially liked the original neckline. Muy bien Guatemala! 8. Miss Panama International Shirel Ortiz--Panama's Shirel Ortiz wore this ivory sequined gown which made the No. 8 spot in my Top Ten of Miss International 2018 Evening Gowns. I liked the tasteful silhouette, perfect length, beautiful bead work and stand-up collar detail. She looked super elegant and regal. 9. 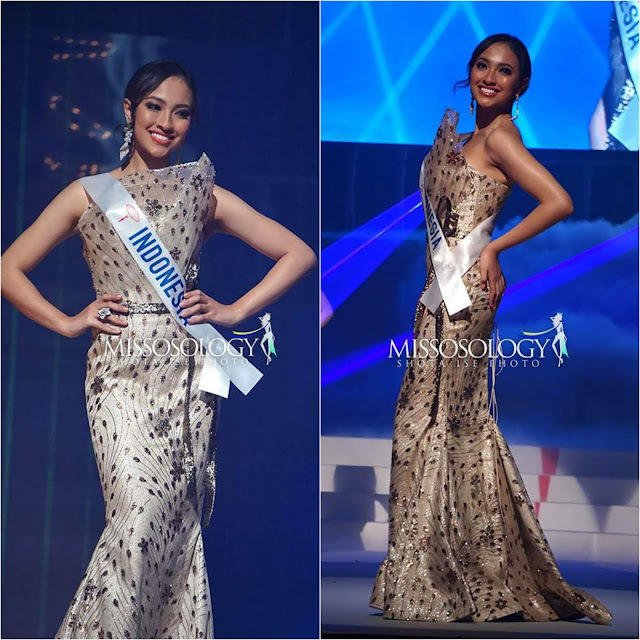 Miss Indonesia International Vania Fitryanti Herlambang--I placed Indonesia's contestant here at No. 9 with this original-looking gown. 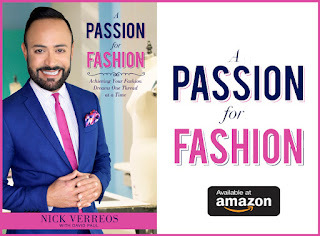 The silver iridescent organza design had delicate black leaf and flower appliques, a dramatic folded-and-draped front top section and perfectly fitting fit-and-flare silhouette. I wished her hair would have looked a bit more modern and I could have done without those whispies but...the gown was very nice! 10. Miss South Africa International Reabetswe Sechoaro--I had to add a non-ivory gown in my Top Ten, just because! 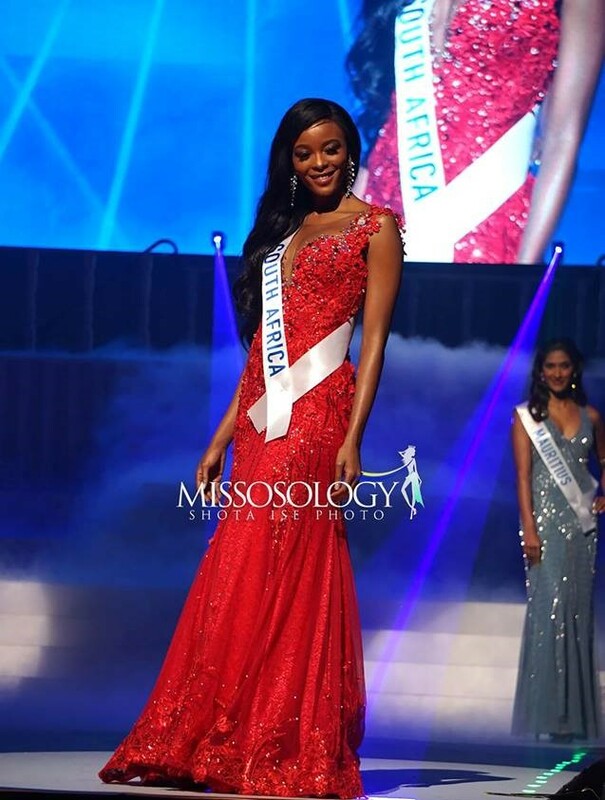 Miss South Africa International had the best non-ivory one in the entire group of 77 contestants. I thought the gown fit her beautifully and I especially liked the rich-looking sequin-and-lace embroidery work in the upper torso. And Felicitaciones to Mariem Velazco of Venezuela for being crowned Miss International 2018, the EIGHTH Miss International for that economically ravaged South American nation that I grew up in a long time ago. It's time they received little bit of good news! 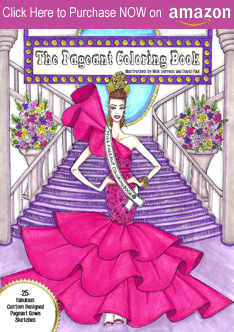 1 Response to "SASHES AND TIARAS.....Miss International 2018 Finals, Top 10 BEST EVENING GOWNS Recap! "